From small sites to large compounds, the radar controlled CCTV camera provides the most comprehensive, automated security detection system available. 360 Vision Technology’s Predator Radar is a high speed, high definition, ruggedized radar controlled pan tilt and zoom (PTZ) CCTV surveillance camera. Predator Radar’s integrated radar controlled, auto tracking and following camera has the power to automatically detect and continually track targets. 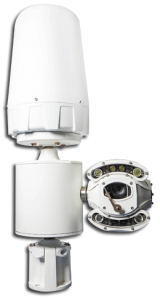 Predator Radar provides the ultimate in surveillance camera performance and can provide an alternative to manned guarding, with a reliable, low cost radar surveillance solution that can deliver automated, continuous perimeter surveillance across any application. Predator Radar can track up to 40 targets simultaneously, up to a range of 400m radius. Ideal for airports, commercial sites, critical infrastructure and perimeter / border applications, 360 Vision Technology radar surveillance detects, tracks and identifies threats, within and beyond any perimeter, and can identify potential threats before they enter a site. The Predator Radar CCTV camera is designed for applications where wide area detection and tracking of moving objects is required. 360 Vision Technology’s radar technology works in all weather conditions, including rain, fog, snow and mist, and within extreme hot or cold climates.